As part of their on-going process to ensure mariners are supplied with official UK Hydrographic Office stores which have come from companies meeting the high standards expected by the UKHO, from 1 January this year, there has been a requirement for all sub-distributors or 're-sellers' of their products to demonstrate ISO9001 accreditation. This is also likely to be your best route for sales, value for money, knowledge and more importantly, safety. For information, DGM do not supply to any sub-distributor or 're-seller' and thus our clients and customers can be sure they are getting a genuine product with the most professional service. Refresher training requirements - Are you ready for 1st Jan '17? If the courses have been completed five of more years ago you will be required to conduct a short updating course of either half (for Personal Survival Techniques) or one day duration (all other courses). With training schools rapidly running out of places, don’t leave it until it's too late to get your training done. It is important you also remember that you will need to carry the original certificates of both your initial course as well as the certificate of the updating training on board the vessel with you at all times. What if my initial course is older than 5 years and I have not updated them? From 1st January 2017 you will not be allowed to sail, not able to revalidate a CoC and it may lead to a deficiency on Port State Control inspections. I hold the advanced fire fighting and sea survival certificates, do I still need to update the basic courses? YES, both basic and advanced fire fighting and sea survival courses need to be updated. I did my initial safety course more than 5 years ago, do I need to the full course again? NO, you will be eligible to do the short updating course, regardless of when you did your initial course. What about the medical courses? Only the Proficiency in Medical Care (“Ship Captain’s Medical”) needs to be refreshed every five years. However this is an EU requirement rather than a STCW requirement so may not apply to you. First Aid courses do not need to be updated. We're delighted to announce as part of our on-going support of the maritime industry, DG Maritime have been awarded distributor status with both Garmin and Navionics. This now means we can now provide from the wide ranging catalogue, the relevant chart plotter cards of navigational data to be used as an aid to navigation for small craft. Additionally, we can assist in the replacement or upgrade of your Garmin plotters by advising on which would suit your requirements before then obtaining the best deal to supply the product to you. With each of these providers offering differing chart formats for a variety of plotters, we'll more than likely be able to meet your demands. Furthermore, we often find many users don't realise they can obtain free or massively reduced prices on updates to their navigation cards. We recommend you talk to us about this service as they should be kept up-to-date to ensure you have the latest information to hand for the safety of your movement on the water. Further details on the areas of coverage can be found at the links below. We'll be updating the "client only" area of our website soon and additional pages will appear on our public catalogue over the coming weeks. If however you don't see what you're looking for, please just contact us. The Cayman Island Shipping Registry have today issued a new shipping notice governing the carriage and use of ECDIS on their Flagged vessels. This superseeds shipping notice 08/11 which had been cancelled last year when the requirements for the submission of a Risk Assessment were withdrawn. All Cayman Island vessels carrying, using or thinking of switching to ECDIS must read this notice. While Appendix 3 of the document details training within simulators, it is highly recommended any member of the bridge team using the ECDIS at sea should be familiar with the points in this appendix and able to demonstrate them as a port state inspector may ask. Don't forget, with our years of use and dealing with multiple ECDIS, electronic charts and licencing issues, if you've any questions or require clarification, please don't hesitate to get in touch. We've been busy here over the past few months and we're now pleased to report the launch of a new website which provides access to all UKHO ADMIRALTY charts and publications in both paper and digital format to any mariner not signed to our navigation management. Via a new website www.ukho.dgmaritime.com anyone can access the on-line catalogue to purchase or enquire about paper charts, publications and digital licences to ARCS, AVCS, e-NP's and ADP's. Furthermore, with our Print On Demand facility, orders for paper charts can be turned around and dispatched the same working day (for orders placed before 1300 GMT). Full Navigation Management - for a below industry average cost, clients (be they shipping companies, management companies or individual vessels) will have a dedicated account manager assigned to them who is responsible for ensuring the vessel is aware of new edition charts, publications and licences as necessary. We can't force you to take them, but you will be aware when there are updates to your outfit. As our account managers all have years of maritime experience at sea on the bridge, their level of knowledge exceeds probably any other company claiming to supply a similar service. Additionally, as we're driven by safety at sea and not profit margins, you won't be sold stores or licences you don't require. Access to this service is via this website through the client login at the top of the page. One-off purchases - Using our new website at this link, customers can make individual purchases of paper and / or electronic charts and publications for their vessel(s). Stores will be dispatched as soon as they're in stock (if not already held) and in the case of paper charts this can be the same working day. Continuously striving to support the maritime industry, we're delighted our new website means we can now support any vessel or customer who is not looking for full navigation management but does want the help and assistance in maintaining their outfit from a company of professional mariners who understand their needs. As part of their on-going improvement of maritime safety, Da Gama Maritime (DGM) are pleased to announce we can now provide vessels and private islands with an on-going contract for the approved annual maintenance of their portable firefighting equipment by IFEDA certified personnel. WIth our maritime fire instructors already familiary with the equipment and working directly in the training of crew and staff on yachts, ships and private islands, it seemed only logical for us to offer a service contract for the maintenance of the equipment. As we already supply fire extinguishers and other portable safety equipment we can now establish a contract for the annual maintenance by which an industry approved engineer will visit the vessel or island to conduct the necessary servicing. Keeping the safety of the mainer as our number one priority, we will ensure the crew and management are made aware of any deficienceis, dangers or hazards associated with the equipment of surrounding area. Furthermore we would encourage clients to utilise the opportunity to combine the annual servicing of their fire equipment with a crew fire refresher training. As DGM provide both services not through a sub-contracted party but by their own highly skilled and experienced staff, we can assure you of only the highest standards exceeding all others claiming to provide a similar service. 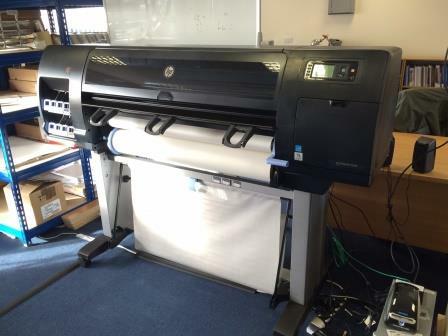 We are delighted to announce the facility to print ADMIRALTY Print On Demand (POD) charts from our Chichester office. So what does this mean to our clients? While we will continue to order the majority of required charts from the UKHO at Taunton, should their delivery come up short, be out of stock or should a client require a chart more urgently, we can now print the required items at our office for immediate dispatch including same day for orders received before 1300 GMT. POD charts are printed on official ADMIRALTY paper to the same high standard as you would expect if it was coming from the hydrographic office itself. As the end user you won't see any difference except on the back of the chart where there will be a sticker guaranteeing authenticity and accuracy instead of the printed ADMIRALTY text. As usual, DGM are engaging with the UKHO to further improve the standard of these charts in an effort to aid all mariners and we'll keep you informed of progress. And the best news - there's no increase in cost to clients for this service, just a further improvement in the speed at which we can assist you! With business continuing to boom for DG Maritime as more vessels recognise the higher standard we set to our competitors, we're moving this week to an office with more than double the space of our current location. Providing significantly more space for charts in storage, it also gives our in-house chart correctors more freedom to work, our navigation account managers more areas for creating further services to assist their clients and our vessel trainers the wall space they need to continually develop better operating procedures and ideas for firefighting at sea. And there's even space for a comfortable cup of coffee as well as providing a more open reception for customers to come in and purchase ADMIRALTY Products directly. So if you're in the area, come on by and see what we can do for you. 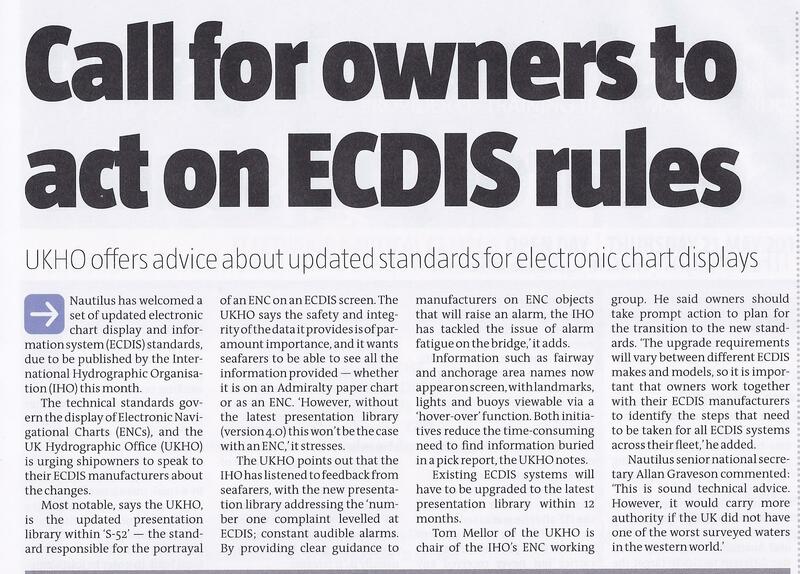 With the IHO about to issue new guidelines, the importance of ECDIS users to ensure their software is up-to-date becomes more important. If you require further information please don't hesitate to contact us. Article courtesy of the Nautilus Telegraph. There are other factors which need to be considered before specifying Dry Powder extinguishers for use indoors, particularly in heritage environments, besides the ones quoted in the extract above. 5. if used in a kitchen environment, food will be contaminated and will have to be thrown away. The cost of clearing-up can be substantial. A church a few years ago was vandalised by the wanton discharge of a single dry powder extinguisher. The insurers (Ecclesiastical Insurance Office - EIO) had to pay out some £250,000 to clean up the church, including dismantling and rebuilding the organ and erecting scaffolding to enable the cleaning of high-level windows and other stonework to avoid long-term damage. As a result the EIO has told the thousands of churches it insures not to have dry powder extinguishers on their premises; it also triggered the introduction of the above clause in the BS 5306-8 revision. They were originally developed for the control of liquid fuel fires in industrial plants, fuel stores and aircraft crashes where very rapid knock-down of the flames was required either to mitigate damage or to enable the quick rescue of people, as from aircraft. They have a high extinguishing capacity for their weight, hence their popularity. But they have a particular limitation in that unlike foam extinguishers they do not form a protective coat over the liquid once the fire is extinguished, so that reignition can easily occur. For that reason there is still a need to apply foam as soon as possible after extinction. Their move into general use came about as the result of research which provided new powders capable of extinguishing a wider range of fires, including the most common 'A' class (wood, paper, fabrics and other carbonaceous materials). But they have their limitations on these fires as well – they will not extinguish deep-seated or smouldering fires very well; a water-based extinguisher is much better for such fires. As part of their ongoing mission to bring a more professional navigation management service to the maritime industry and in the wake of their award of ISO9001:2008 certification by Lloyds registry earlier this year, DGM are delighted to announce they have been approved by the UKHO as a full distributor of all ADMIRALTY paper and electronic products. Growing the company predominately through reputation alone, their managing director Steve Monk, paid tribute to the team of employees who have worked incredibly hard to adapt to changes and demands inflicted upon the company recently to ensure standards were in no way compromised and clients saw no dip in service. “I’m incredibly proud of the work our small but dedicated team have put into ensuring the UKHO were entirely satisfied by the standards we set in both our work place and to our clients. Our focus has always been helping the mariner to maintain their safety at sea through professional navigation management and on board crew training. The team may be small in number but with nearly 100 years maritime service between them, their level of knowledge and experience far exceeds many other companies offering similar services. The maritime background of the DGM staff means they have each been working alongside or with the UKHO for many years but now with the award of the distribution status, they are able to supply the paper and electronic products direct to customers, old and new. Their familiarity with the entire UKHO range of products means they are well aware of the SOLAS requirements and have a greater understanding of which high quality ADMIRALTY products are best suited to each client. DGM have provided navigation management to the Superyacht industry since 2009 and are already seeing the benefits of their new status with more clients enquiring about and moving across to their personal service. With business continuing to grow and more specialised employees being brought in, they have their sights set on a wider customer base. Whether it’s with shore based management companies or individual vessels, DGM will be looking to work more closely with the commercial sector and although until now requiring customers to sign to their full management, they will shortly be launching a new ‘public’ catalogue website to enable anyone to purchase UKHO related products and licences. DGM can now provide you with access to a phenominal foam agent in a variety of firefighting media to help maintain your safety on board. The agent is available in small cans which can be stored for use in cabins, galleys and guest areas for quick response all the way through to drums of agent to be used with inductors to generate huge quantities of foam for use in engine room fires and helicopter crash on deck. FireAde 2000 is an environmentally friendly agent with no shelf life so it's perfect for the maritime environment. With a 3% concentration for use it also has a greater duration for the same quantity as standard 6% AFFF. WIth an incredible knock down capability of A & B class fires, what's amazed us more is the ability of the product to prevent 'burn back' and reignition. Spray this product on surfaces for protection in boundary cooling and providing a safe route of exit for personnel as well as protection of areas surrounding a fire as we show in some of our videos available at the links below. Enforcer 3 test on Class A and B fires. Class A fire tackled by FireAde 2000. FireAde 2000 against a Chip Pan fire. DGM are proud to announce their navigation management procedures have been awarded ISO9001:2008 certification as a result of their high standards and professional service. The certification covers ‘Vessel Navigation Management and the procurement, supply and updating of navigation related charts, publications and stores to the maritime industry worldwide’. In order to demonstrate to the industry just how seriously DGM take their procedures we engaged with Lloyds Register Quality Assurance (LRQA) who are internally recognised for the high standards they demand. The requirement to achieve a robust and constantly improving quality management system and customer focus is very much the ethos of DGM and we were delighted to work with LRQA to achieve this. “I’m proud of my staff for the work they have put in to demonstrate to not only our clients but now to be recognised formally for achieving this international standard. Since company inception we have been constantly striving to not only enhance safety at sea with our navigation management, but to make it a safer place for mariners to work as a result of our on board crew training. “It was important for us to ensure we demonstrated to the maritime industry that we set the highest standard and won’t accept second best. Therefore while it may have meant refining further the procedures we already had in place, to achieve the certification through LRQA is a major achievement. DGM are a business who provide navigation management to the Superyacht industry but are breaking into commercial shipping due to their understanding of what mariners do and don’t require to safely navigate. Through their experience with ECDIS they are also able to offer advice to vessels wishing to migrate to ‘paperless’ navigation and can also assist with developing procedures, checklists and incorporation into the SMS. DGM also provide on board firefighting training with bespoke packages for vessels of any size and their professionally trained fire instructors regularly work with Superyachts and merchant ships. Conducting this on board the vessel allows procedures to be examined, discussed and if necessary amended while also giving crew the ability to be trained on their equipment in their environment. Two more yachts have signed to the DGM navigation management service having recognised the professional background of our account managers and high standards set by the company. With DGM now exceeding the standard of other management companies, two further yachts have entrusted this company to save them time and money in respect to maintaining their navigation safety. Furthermore, with our account managers having each spent over 20 years working at sea or in the maritime industry, their level of knowledge of which products are or more importantly sometimes, are not required, means we can keep bridge officers informed of the best way to keep their outfit up-to-date. If you want more information on the level of service we could provide you, don't hesitate to get in touch or download our brochure. The agreement further complements WSA’s distinctive group of established business partners offering a range of high quality services in support of the superyacht sector. Da Gama Maritime is run by experienced mariners at the forefront of advancements in navigation management and vessel safety who recognise the significant undertaking required by crew to meet and maintain compliance with all current and expected legislation. DGM supports professional mariners in the safety of navigation by maintaining compliant navigation outfits and training crew on board in fire fighting drills, procedures and exercises. Steve Monk, Managing Director at DGM, said, “This company was established to enhance the safety of those who work at sea through the highest professional standards in navigation and fire fighting. We are therefore delighted to have been recognised for these skills by WSA and to now collaborate with the Academy and become a business services partner. As you would expect and the feedback has shown, considerably more effective results can be achieved training an entire crew on board their own vessel. We aim to continually strive to promote their skills and professionalism through this new working relationship that will benefit both parties, and ultimately all those on board. By working in partnership with some of the most dynamic and innovative organisations in the superyacht industry, and by linking their resources, facilities, knowledge and experience, Warsash Superyacht Academy’s delivers a wide-range of premium-quality business services and course provision to support the exceptional standards required by the superyacht sector. The Academy’s business services partners cover recruitment, yacht and crew management, yacht surveys and audits, interior hospitality and on board training, consultancy, specialist and travel services. Their partners include; BURGESS, Viking Recruitment, Wilsonhalligan, Interior Yacht Services, Marine Matters, MedAire, Regs4yachts, YachtsXL, Elite Crew International, Captain Barry Sadler Maritime Training and Consultancy, Southampton Solent University and Warsash Maritime Academy.